Last week, West Health’s executive leadership continued to drive the conversation on transforming our healthcare system by enabling connectivity of medical devices and providing the cost and quality of healthcare prices to patients and payers at national healthcare conferences in Chicago and San Diego. On Monday, October 6, Nick Valeriani, our chief executive, led a panel discussing big data in healthcare at the AdvaMed 2014: The MedTech Conference in Chicago. The panel focused on big data in healthcare and how interoperability plays a leading role in moving that data. Participating panelists included Jay Anderson, senior vice president and CIO at Northwestern Memorial HealthCare; John LaLonde, a vice president at Medtronic; and Stephen Jones, president and CEO of the Robert Wood Johnson University Hospital and Health System. 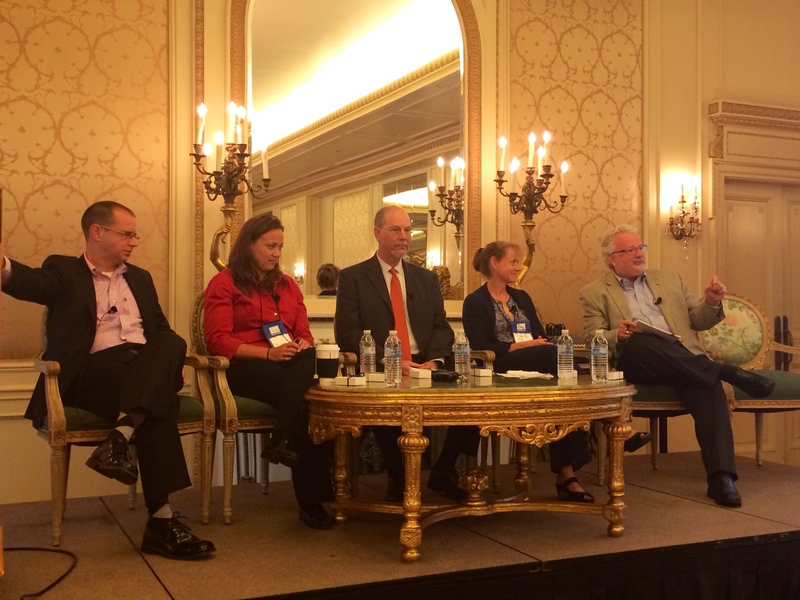 The panel discussed how to ensure data is meaningful and actionable to improve patient care. “Our job as CIOs is to run very complex systems to help us better serve our patients and families,” said Anderson. The current lack of medical interoperability is seen as preventing big data from broader application in healthcare, costing the healthcare system more than $30 billion a year. Shelley Lyford, our chief operating officer, kicked off West Health’s session, “Transparency: Catalyzing Change in Healthcare,” on Thursday, October 9, at NAHDO’s annual conference. She announced our support for the creation of a manual for states to develop and implement All Payer Claims Databases (APCDs). Doing so will provide patients and payers with more information about the cost and quality of medical procedures. Lyford noted that the states with APCDs in place are saving money. High-price hospitals are reducing or justifying their prices as a result of their cost information being readily available. “We’d like to see these benefits realized nationally, and we’re taking action on APCDs, because, frankly, they provide the greatest opportunity for cost savings – more than $55 billion over the next ten years,” Lyford said. Dr. Joe Smith, our chief medical and science officer, followed up by leading a discussion on healthcare transparency with Jo Porter, deputy director for the Institute for Health Policy and Practice; Niall Brennan, director of info products and analytics at the Centers for Medicare & Medicaid Services (CMS); Ernie Valente, senior director of healthcare transparency at the Pacific Business Group on Health; and Doris Peter, director of the Consumer Reports Health Ratings Center, part of the nonprofit organization Consumer Reports. Their 90-minute conversation centered on how transparency – providing information on the quality and price of healthcare procedures in advance – will enable informed decision-making and an efficient medical marketplace. “When it comes to transparency, people need to realize: One, it’s inevitable; two, it is way harder than it looks; and three, it’s very much a work in progress,” said Brennan. Thanks to AdvaMed and NAHDO for hosting these critical discussions on data-centric issues in healthcare that will help drive better outcomes at a lower cost for patients, a central mission of West Health.